Did you know you can now order your Deliveroo takeaway from Oaka at The Mansion House here on View? Oaka at The Mansion House is a pan Asian restaurant and pub serving a variety of real ales. Oaka at The Mansion House also features a large outdoor terrace, ideal during clement weather. 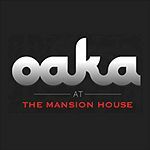 What did you think of Oaka at The Mansion House? Should you think of Kennington at all, you most probably connect it with the famous Oval cricket ground a little further down the road. Or, if more rural pursuits are your thing, perhaps with the Countryside Alliance, whose offices are there. You might not, though, associate the borough with sophisticated, innovative cuisine. And that would be a mistake. Oaka has found a new home in The Mansion House, an imposing building that used to be a pub. Sitting regally on Kennington Park Road, it looks rather incongruous, like a lady wearing a ball gown when everyone else is in jeans. Floor-to-ceiling windows are framed in light wood, making it stand out on a wintry March evening. Inside, it’s swanky — there’s no other word for it. The bar area is tiled in black and white, with stools and more comfortable seating separated from the restaurant, where neutral colours and dark wood abound. High on the walls, old-fashioned taps trickle water into a trough — their gentle tinkling music adds to the serenity, but it might make you need to inspect the (well appointed) bathrooms. There is plenty of room between tables, so conversation is not intrusive, even though Oaka fills up fast (despite opening the previous weekend for the first time it is already full). Lighting is subtle but sufficient to see by, which is handy, because the menu is extensive. With dishes from Thailand, Japan, Korea, Vietnam, Malaysia, Singapore, Indonesia, Laos and China, there really is something for everyone. However, it has to be said the choice is somewhat boggling. To start, a great option is ‘gap glam’. Nothing to do with filling a gap glamorously, this is Thai for ‘beer food’ - a sort of eastern tapas, if you will. The wait staff know the menu well and will happily advise; they suggest three or four gap glam for two people, which proves about right. Fried mackerel doesn’t sound at all glamorous, but is piping hot in a crisp (but not too thick) batter, and is deliciously juicy inside. It is marinated with sake, soy sauce and herbs, but none of the flavours overwhelm the fish. Meanwhile, one of the signature Oakham ales is used to glaze the baby back ribs, which gives them a delicate citrus flavour. The Advertising Standards Authority need not trouble itself with Oaka’s ‘heavenly beef’ — the air-dried meat is marinated in palm sugar and coriander and is delightfully sharp-sweet — utterly heavenly as advertised. If you like Thai food, you must order ‘sai oua’, a pork sausage scented with lemongrass and kaffir lime leaves — it has all the flavours of Thailand rolled into one. Prices for gap glam start at £3.50 up to £9.80 for the baby back ribs, but most are around the £6.90 mark. There are two platters on offer, or for £19.80 you can choose any four dishes. Among the main courses, there are several ‘chef’s specialities’ — always a good bet. A Japanese chicken hotpot (£12.80) turns out to be very similar to yakitori; succulent chicken thighs marinated in sake, soy and mirin (a sweetened rice wine) with leeks. It comes in its own (hot) pot and is just the right amount after all that gap glam. The ‘massaman’ curry (£10.90) features lamb cooked with potatoes, tamarind, star anise and palm sugar. The meat is tender and the dish is not too hot. Oaka helpfully marks its menu with red chilli peppers, denoting heat — one being mild, three being volcanic. Should you need to put out the fire, puddings include a variety of sorbets and ice creams. It’s all about the ale. Oaka showcases award-winning Oakham ales, from a brewery in Peterborough, with many surprising flavours, such as grapefruit, elderflower and paprika. The beers are seasonal, so you may find Citra (with a powerful grapefruit aroma and notes of lychee and gooseberry), Attila (scented with elderflower and red berries), and Dreamcatcher (with the subtle heat of paprika). If you’re not sure which to have, ask — the staff are very enthusiastic about their ales and will be happy for you to try them. And they serve two-thirds of a pint, an unusual but welcome measure. Oaka already offers a takeout food service and is planning to be able to offer its beers too — the complete package for a cosy night in. Genius. Not a beer drinker? Fear not; Oaka has an extensive wine list, starting at £16.50, with glasses at 175ml and 250ml. A white Rioja, at £18.25, proves a glorious match for Oaka’s fabulous food. With eclectic food attractively presented, charming staff and exciting and unusual beers, Oaka at The Mansion House promises to put Kennington well and truly on the map.